If you would like to boost your energy level, but are hesitant to use any of the energy drinks sold in your local store, you are not alone. Ever since the U.S Substance Abuse and Mental Health Administration released its bulletin1 about the significant health concerns posed by energy drinks, major media outlets, such as the New York Times, have spread the word. The reason for the alarm is that the number of emergency room visits related energy drinks doubled in the four years between 2007 and 2011. Additionally, the Daily Mail reports that a Canadian research study found that the use of energy drinks is associated with mental health and substance abuse issues. Clearly, there must be a safer, natural way to boost your energy level. If you want to increase your energy throughout the day and improve your health at the same time, take a closer look at bee pollen supplements. For centuries, practitioners of traditional Chinese medicine have used this powdery substance produced by flowering plants to treat fatigue. 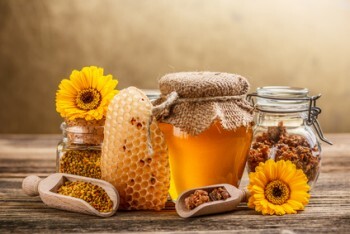 Recently scientific research has found that bee pollen is a perfect food because it is dense with essential energy-boosting nutrients that your body needs.2 So what exactly are these energy boosting nutrients? Carbohydrates: Approximately 55 percent of bee pollen is carbohydrates, which are the fuel that powers your physical and mental activities. Protein: As you use your muscles in your daily activities, small fibers become damaged. Fortunately, your body uses protein to repair muscle cells. Bee pollen is 40 percent protein, 50 percent of which is in a form that is ready to use by your body. This saves energy that would be otherwise used by your system to convert the protein into a useable form. Additionally, since your body can repair your muscles quickly with the free protein, you are less likely to experience the tiredness that occurs after a strenuous physical activity. B vitamins: Bee pollen is rich in B complex vitamins, which your system uses to produce energy. Additionally, these nutrients help optimize the performance of your nervous system, which helps you to stay alert and focused. Vitamins A, C, D, and E: These nutrients are essential for optimal immune functioning so your body does not have to expend energy fighting infections and diseases. To experience the full energy boosting power of bee pollen, you need to choose a supplement that contains pure bee pollen that is free of environmental contaminants and any synthetic fillers. We recommend the Natural Energy supplement from Xtend-Life which uses pristine bee pollen from New Zealand. If you want to experience a safe and natural energy boost be sure to order your bottle today. 3 Carpes, Solange Teresinha, Begnini, Rosicler, Alencar, Severino Matias de, & Masson, Maria Lúcia. Study of preparations of bee pollen extracts, antioxidant and antibacterial activity. Ciência e Agrotecnologia, 31(6), 1818-1825. (2007). Retrieved from http://www.scielo.br/scielo.php?script=sci_arttext&pid=S1413-70542007000600032&lng=en&tlng=en. 10.1590/S1413-70542007000600032. 4 Kroyer, G. and Hegedus, N. Evaluation of bioactive properties of pollen extracts as functional dietary food supplement. Innovative Food Science & Emerging Technologies. 2(3) 171-174. 2001.doi: 10.1016/S1466-8564(01)00039-X.